They were gone — memories of the now-grown Allie playing hide and seek, hugging the family dog and dressing up for Halloween. Patty Dennis felt sure they were lost forever. They weren't. 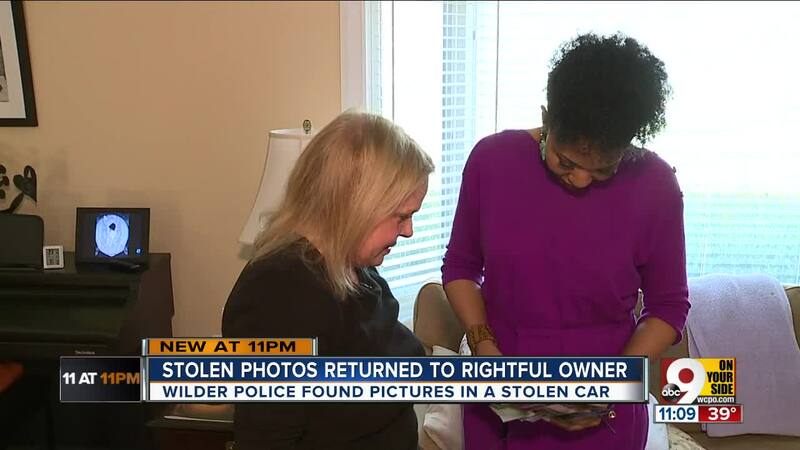 WILDER, Ky. — Patty Dennis knew she shouldn’t have left her car unlocked in her driveway, she said Friday, but it became a habit. She had lived in the same Madeira home for three decades without ever being robbed. When it happened, she almost didn’t realize it had. The people who stole from her back seat in early March didn’t take money, medication or anything with market value. They took something more important: A portfolio full of five-by-eight pictures from her daughter’s childhood. She had hoped to use them as inspiration in her regular Thursday evening painting class. They were gone — memories of the now-grown Allie playing hide and seek, hugging the family dog and dressing up for Halloween. Dennis felt sure they were lost forever. Wilder arrested Toshia Noel and George Gattis, both 36, in a gas station parking lot days later. The pair were traveling in a stolen car with over $500 in stolen property, including heroin, strangers’ medication and a trove of stolen bags, according to the accompanying police report. Most of the bags had receipts or other information that would identify their owners, Officer Brandon Vance said Friday. One didn’t: A portfolio full of pictures of a blonde-haired little girl. Allie. Police posted the photos on Facebook, hoping to find their owner. Dennis didn’t see them there at first — she learned about them from a craft store cashier while shopping for a replacement portfolio. He doesn’t need the thanks, he added. As for Dennis, she said she’s learned to lock her car.